We also have other 6 arrangements of "There Is Sunshine in My Soul Today". From Katrine Miner: Gorgeous! Love the melody and text together, and the harmony is just enough to compliment, not overshadow the melody. From Bonnie Ford: I must admit, I had reservations about this hymn arrangement but as soon as I listened to it, I felt as though I had heard it before. I have never heard the Primary song that you speak of, but the arrangement you have put together speaks to the sunshine that comes through a peaceful sunrise after a stormy night of trial, "For weeping may endure for a night, but joy cometh in the morning." Through the graceful style of the music and arrangement of the harmonies, this is the image that comes to my mind. I love the hymnal version, but that arrangement invokes an image of the bright sun at noon day, which is great! But sometimes the most powerful sunshine can be felt after enduring a night of storms. Thank you for sharing your gifts a talents. I will surely have my choir sing this piece! Thanks again. From Love this arrangement!! Just beautiful! However, I was wondering if there was sheet music just like the mp3 that is here on the website. Or maybe even mp3's of the sheet music you have here and can see. I would love to do this with my choir, but want a more accurate reference for them to hear if possible. It's absolutely gorgeous! UPDATE NOV 2015 - This song has been edited from the 2014 version and is MUCH better. If you have an old copy, toss it and try out the new one! Thanks for the wonderful stories that have been shared with me about this song! One day, while cleaning the house, I was humming "There is Sunshine in my Soul." After a while, I realized I wasn't humming the right tune! It took a minute to figure out why the tune was so familiar. After puzzling over it, I realized it was an uncommon primary song my mother had taught us: "An Angel Came to Joseph Smith." The verses of the hymn fit perfectly with the tune of the song. The following night, I awoke with a new melody in my mind, with the words of the chorus "Oh there's sunshine, blessed sunshine...." It was so clear that I could not sleep until I had written it down on a scrap of paper I had next to the bed. I feel that I was more of a scribe than a composer in bringing this beautiful song to light. The inspiration involved was undeniable. I hope that it brings warm sunshine to your soul, as it has to mine. If you have a special experience with it, I would love to hear about it. I dedicated this song to my grandparents, Lynn and Shirley Nielson. They have spent their lives spreading sunshine to many people all over the world. They were both missionaries in Samoa, Alaska, and Idaho. He fought in World War II. 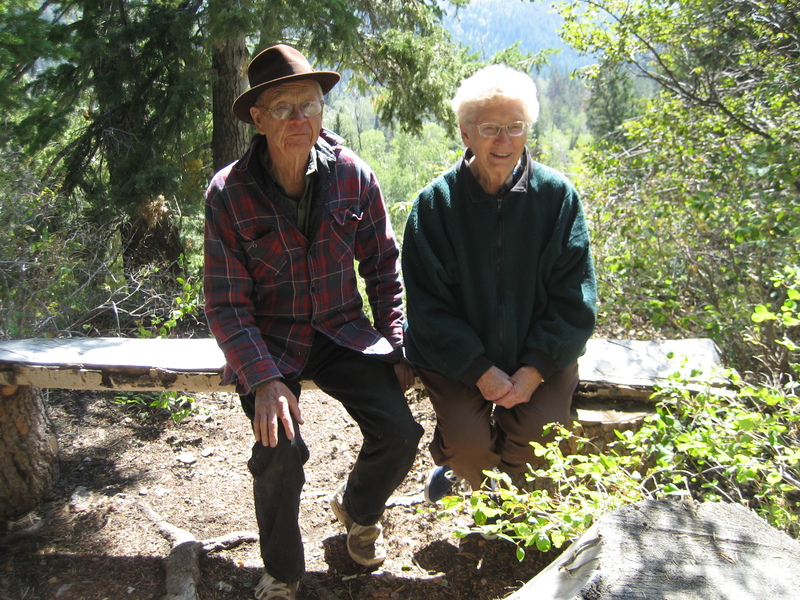 They raised 5 children at the base of Manti Canyon and instilled them all with a strong legacy of loyalty and faith in the Lord. I have felt their “sunshine” uplift and warm my soul many times. This song has been viewed 13298 times on this site. This song's pdf has been viewed/downloaded 3395 times.